Here in Portland, spring might have officially sprung. We’re not totally sure, because the days in Oregon tends to vary wildly between “warm and sunny” and “I’m so cold, why is it still raining?” One of the things we love most about spring is seeing the flower shoots pushing through the earth to soak up the delicious sunshine. The beautiful, vibrant green embodies the lush green of the elegant emerald, no matter the context. While we love the idea of celebrating a birthday in May with an emerald tiara, we know that the cost might be a bit prohibitive (for anyone who isn’t royalty). That doesn’t even take into account being able to get your hands on one! This Diadem belonged to Duchess of Angouleme and is now property of, and displayed in, the Louvre Museum. It’s value is immense not only because of the exceptional stones used for its creation but also because of the fact it is one of the few pieces of jewelry of the period that remain in their original state. This 3.71ctw 18k Emerald Art Deco style pendant is set with 137 glittering diamonds in gorgeous white gold. The pendant features a pear shaped emerald that is held with three prongs, two at the base and a v-cap at the top. The emerald sits above the rest of the pendant in a gloriously prominent position. Click here to view more about this pendant. 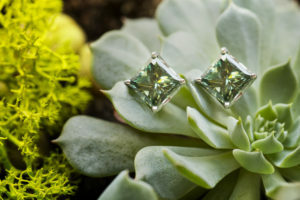 These emerald and diamond halo earrings are truly a work of art. Dramatic, natural Colombian emerald in a head-turning size, these earrings feature combined 1.31ctw center stones. Surrounding the treasured true green is a delicate halo of F/G VS2 diamonds with a combined total weight of 0.30ctw. Click here to view more details. Like many gemstones, emeralds have a multitude of meanings stemming from different cultures and beliefs. In mythology, emerald is the stone of the goddess Venus, resulting in the association of emeralds with romance. Emeralds are said to bring passion, bliss, and unconditional love! Legend has it that wearing emeralds can give you the ability to foresee the future and see the truth. It has also been believed that emerald has the power to cure disease and protect against evil. It would be our pleasure to create a unique custom piece of jewelry for you. Simply click here to get in touch. Summer’s here, which means the wedding season is heating up. A good look can hinge on the perfect jewelry choices, so whether you’re celebrating your BFF’s nuptials or going as a plus-one to your college roommate’s cousin’s second wedding, make sure your jewelry shines. Use your ice to turn up the heat! We all know how sticky PNW summers can get, and it may be tempting to forego traditional fabrics and cuts that you know you’ll swelter in. Dress up flowy, mercifully breathable cotton maxi-dresses and jumpsuits with some well-placed sparkle! If you have six weddings to attend in the next six weeks, crafting a new look for each one might be a chore. Use your jewelry to refresh a piece for the next event—dress up a daytime look with some dramatic dangle earrings, or keep things casual by pairing bright pendant with a classic LBD. It’s good to try new things! Just find your groove—if you feel too conservative for a statement ring, try a couple mini stackers instead! You wouldn’t want to show up in the same dress as another partygoer, so why settle for mass produced jewelry? Consider investing in a custom or one-of-a-kind vintage piece to complete your unique look. Afraid your jewelry have gotten dull or lifeless? Revitalize your collection with a professional deep cleaning and bust out your faves! You want to make a splash, not cause a scene. Big pieces make a statement, but be sure your rings won’t upstage the bride’s! Check out The Jeweled Crescent for all your summer wedding jewelry wants and needs! Is 2017 the year of the diamond dangle earring? The Oscars always offer a peak into future jewelry trends and the scramble starts immediately to copy those designs. This year, we saw an overwhelming majority of stars wearing large diamond dangle earrings. How fun! Of course there were a few exceptions to the trend of large dangling earrings- the shredded gold Tiffany necklace worn by Jessica Biel and the stunning curly diamond necklace worn by Kirsten Dunst (see Jessica on the right). She is indeed smashing! The red carpet didn’t offer up much in the way of rings or bracelets either. What did accompany almost every gown was a sparkling pair of dangle diamond earrings. Would you like to see more? Shop our stores on Rubylane, Etsy and eBay today.